Popular bud oil is good for soothing sore muscle pain, minor cuts, and sunburn. Popular buds are anti-inflammatory and analgesic. The name Balm of Gilead is a Biblical reference to a related species of evergreen tree in the Old World. Variations: Add Juniper, Eucalyptus, and/or the essential oils of choice if desired. Popular buds have a good natural scent, so you want to complement, not obliterate. Place the sticky buds in a bag, then use a rolling pin or even a hammer to bruise and partial crush them. Cover with olive oil and apply a steady heat to infuse. You really can't infuse popular buds for too long, I get the best results by applying very low, direct heat for 2 - 3 weeks. Filter and bottle for use. Balm of Gilead oil makes a great base for salves when thickened with beeswax. Cuts & Wounds : Knowing how to use simple home remedies for healing and disinfecting cuts and scrapes an important part in taking care of your family and yourself. Herb_Infused_Oil :Herb infused oils are easy to make, even for beginning home herbalists. A warm sunny window, dried or fresh herbs, organic olive oil and a little time is all you need. 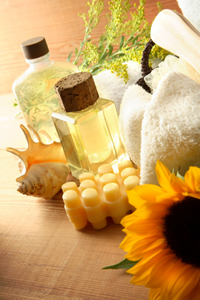 Remedies using comfrey, calendula, St. Johns wort and others are indispensable healing agents for healing agent for treating cuts, scrapes, chapped skin, diaper rash, eczema, and windburn etc..
Sunburns :Herbal remedies like St. Johns wort and tamanu oil offer protection and healing in cases of sunburn.